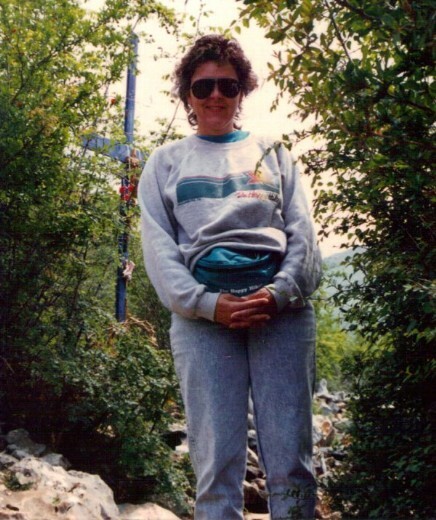 Around late November 1989, I heard about Medjugorje from my friend, Linda who had read an article in her local home town newspaper. It was just a matter of fact statement from my friend, but I was 'transported' back in time to 3rd grade where I had been placed in the middle of the school year in Catholic school from public school. The change in schools happened because my younger sister had been diagnosed with Leukaemia. My mother made a marriage vow to raise her children Catholic and she wasn't doing it. I think she thought if she corrected that vow now that perhaps God would let my sister live, but she died. I was only a few weeks in 3rd grade Catholic school when the nun told us a story about Bernadette and Lourdes in 1858 and I was completely enthralled. This really seemed marvellous to me. I remember after the story was over that I wanted to go there desperately. I was so excited. I started thinking about how I could get there and I looked out the window and thought, well, I know my mother wouldn't take me there, much less believe the story (she was not Catholic) and I felt that the Blessed Mother wouldn't appear to me because she only chose one girl and I didn't think that I was as good as Bernadette, and then I said to myself, well, "if that ever happens in my day, I'm going"! That was the last time that I thought about that 'vow' and that schoolday until the moment when I heard that Our Lady was appearing in Medjugorje. I was so excited and felt 'alive' in an entirely new way. I was going! Somehow, someway, I just knew I was going to Medjugorje. My husband and I watched some videos that a priest, Fr. Joseph Milford (Oblates); gave me who was on my mail route and wow, it just confirmed my belief . I just knew right from the start that this was really happening. Then my husband and I read every book we could get our hands on but my husband was not open to going at all. He said he was not going to a communist country. So, I prayed the rosary on my fingers because I didn't even have a rosary. 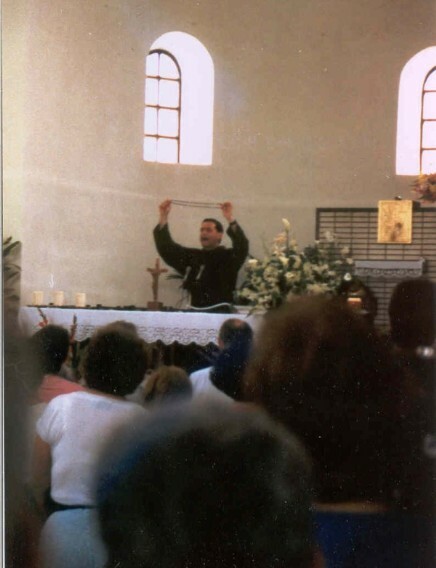 One Sunday after Mass, in January of 1990, John found a flier on a trip to Medjugorje with this church, St. Paul of the Cross. Then he said we could go! Ah, the power of the rosary! We had four months to prepare and we just knew we had to prepare with prayer and all that Our Lady was asking for. My prayer was for God to give John 'more than me' while we were there so we could stay happily married because I was going to go back to the Eucharist and my Catholic faith no matter what (and since I never discussed my religion with John since I hadn't thought about it in many years, he knew nothing of what the Eucharist is). My initial immediate calling when I heard about Medjugorje was to go back to the Eucharist because, you see, that belief never left me. I had just forgotten about all of it....and I had to have Jesus now. I was ready to give up everything to do that. I went to confession after 20 plus years to a new priest of one year in 1989, a Fr. Thomas Euteneur. I started going to daily Mass with John and I received Holy Communion. John and I lived as 'brother and sister' until our wedding day in the Catholic church. We arrived in Medjugorje on the bus after midnight on May 25, 1990 and ended up parked on the street in front of St. James Church. Our group had spent a few days in Austria and I was so very sick with the flu and fever. While we were waiting to figure out where we were staying, our new friend, Jim suggested that the 3 of us walk over to the church. We did and as we were walking, I said to them with a little humor and a sense of hope, "well, if I drink this holy water and get well, then Our Lady is really appearing here". I already believed She was appearing here, I just didn't know that 'miracles' were up for the asking! It was dark, the church was closed and yet there was a fountain around the statue of Our Lady outside and I drank from the holy water. And I got well immediately. I also was not tired at all the next morning with only a few hours of sleep and that has never happened in my life. To this day, I have never seen that fountain of holy water in any pictures. 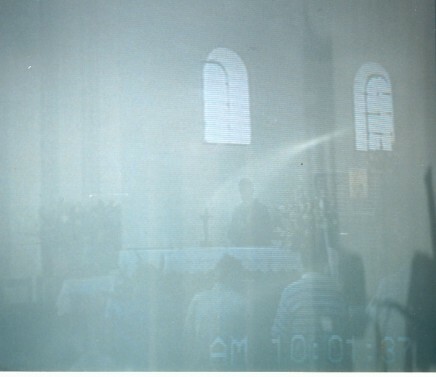 That first morning in Medjugorje; May 25, 1990, we went to the 10 am English Mass and afterwards, the priest, Fr. Pavich, blessed all the articles and John decided to hold up his camcorder and looked at me to see what I thought...I thought right away, why not, it was like a little kid asking... I never thought about blessing a camcorder but what did I know...so it was blessed....so I raised up my new camera and had it blessed also. OK....look at the bouquet of flowers on the altar....look at the tall Lily and the stick of thorn to the left of the lily, and you will see in between those two , image of Jesus crucified face...now look to the right of the lily and you will see the Blessed Mother's face slightly leaning towards Her Son and on the video you can see HER gold crown and you can see it in the photo too...now that evening, our priest said we should meet and share our day with one another....well, I was so overwhelmed and just in awe about this since we could see the image of Jesus in the camcorder that I stayed in my room while John, very excited; the only non-Catholic went down and testified to what he saw and the image that was left and stated to the group that HE NOW KNOWS THAT JESUS IS TRULY PRESENT IN THE EUCHARIST, ....now, he did not know that at all before....so John's testimony was a real blessing for the group and especially for our priest, Fr. Venezia. One day during the apparition that was taking place in the church we saw the sun spin, pulsate at us like a beating heart, throw colours out and at one point there were 3 small clouds with three crosses going through them one at a time - and then at the end, Our Lady, from head to 'toe cloud', appeared in the sky, plain as could be!- so incredible! We were outside praying the rosary because the Mass at that time of day is in Croatian and for the people of the village. During the Thursday night rosary prayer meeting that Ivan group has on Apparition Hill, Our Lady came that evening and it was so quiet. A whole group of us were going up the back side of the mountain which leads to the blue cross (where Our Lady first appeared to the children). This is where Ivan has his apparition on his rosary prayer nights on the hill. It was so dark we could barely see anything but we knew there were huge rocks everywhere. I stumbled along and found a spot to sit and was leaning up against a rock wall. John and others were kneeling in front of me and to the side. I thought about kneeling but the rocks had jagged edges and there didn't seem to be any room. The next thing I heard was that Out Lady was here and it was quiet before but now it was complete silence. Then 'someone' punched me directly in the middle of my back and I hit the ground kneeling. I knew immediately that this was impossible since my back was up against the rock wall. I thought I had probably cut my legs because the force of the punch was dramatic but I didn't dare move an inch because I knew it was the 'hand of God'. When the apparition was over we all got up and we walked back down the hill. My legs were not injured or bleeding at all and I had no pain. Later on, back home, I found this message from Our Lady - On June 25, 1988, Ivanka, one of the six Medjugorje visionaries, during her apparition, said to those present at the apparition, many of whom were standing up or sitting: "Our Lady wishes for all present to kneel down." We also could look over at Cross Mountain and see the Cross as plain as day. It was all lit up with supernatural light because there were no lights on either hills in 1990...and there is no way you should be able to see this Cross, too far away and black as night outside. I didn't realize this at first but as I was walking down the mountain, I looked over and of course, saw nothing but night time blackness and this is when it finally registered what happened. There was no electricity on the mountains. Things like this happened to us the entire time we were there and to millions of others! It was as though you were not on the earth but experiencing something supernatural. Even climbing the hill was like being 'lifted' up there. We helped very old people and injured people up the hill and it was almost effortless for them and us. We came back home and John went to RCIA to learn about Catholicism. He became a Catholic :) and we got married in the Catholic Church one year later on miraculous day, May 25, in 1991. We love daily Mass and Rosary and try to live Our Lady's 5 stones which is daily Mass, daily rosary, monthly confession, fasting, and bible reading. John became a lecture and we started making the Mother Theresa rosary because I had read the story in the Catholic Digest in 1991. It has become John's exclusive ministry now, making these Mother Theresa rosaries, (over 8,580 to date, 07/07/2010) and to give them away to whomever Blessed Mother puts in our path. Many miraculous stories have come back to us through the years because of this rosary. That's another story....so many miraculous healings physically and spiritually and emotionally but 'believing is the key to the miraculous.' It is a 'thin veil' from the natural to the supernatural when you pray to God from the heart.